I should clarify that the vertebrae above show that character transformation in this individual, at this point in its ontogeny. 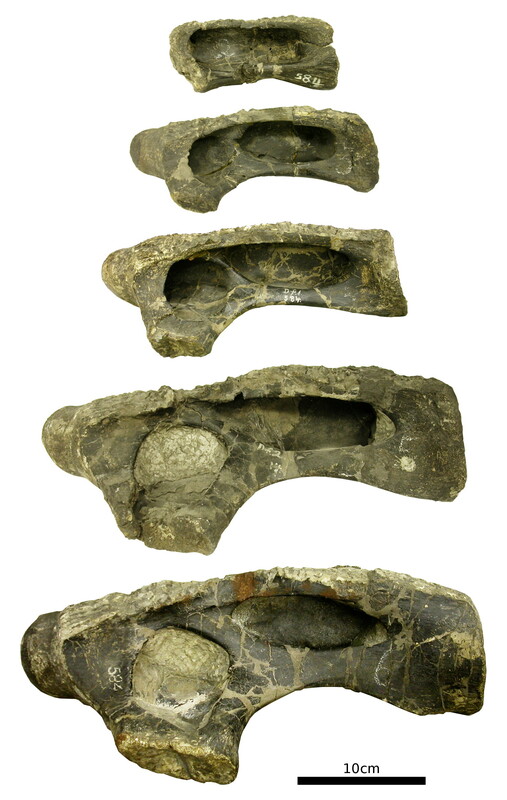 The vertebrae of CM 555 are about two-thirds the size of those of CM 3018, the holotype of A. louisae. 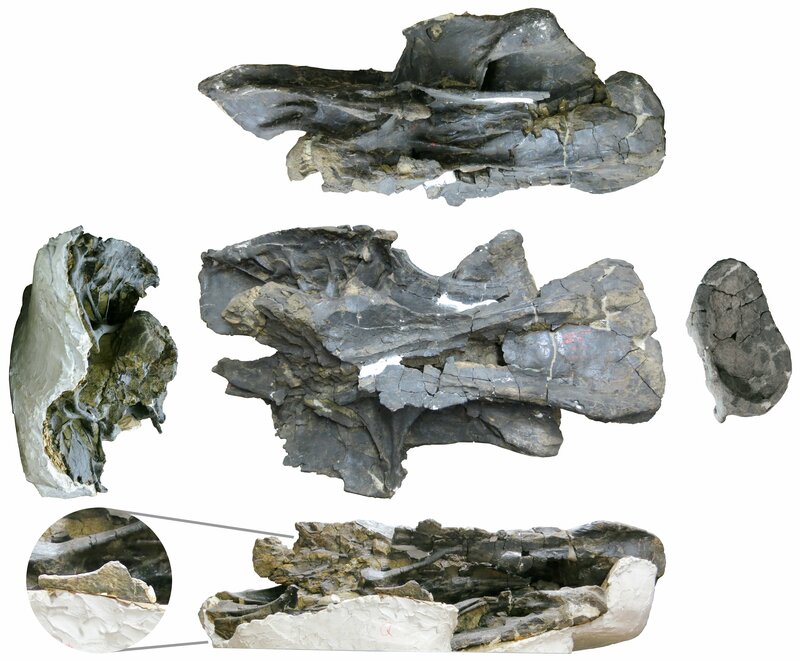 In CM 3018, even C4 and C5 have completely divided lateral fossae, corresponding to the condition in C6 of CM 555. 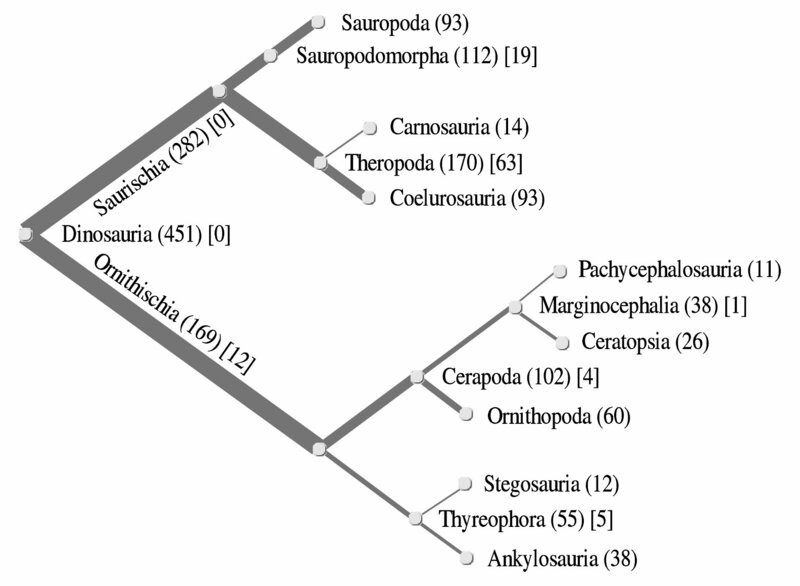 As Mike and I discussed in our 2013 neural spine bifurcation paper, isolated sauropod cervicals require cautious interpretation because the morphology of the vertebrae changes so much along the series. 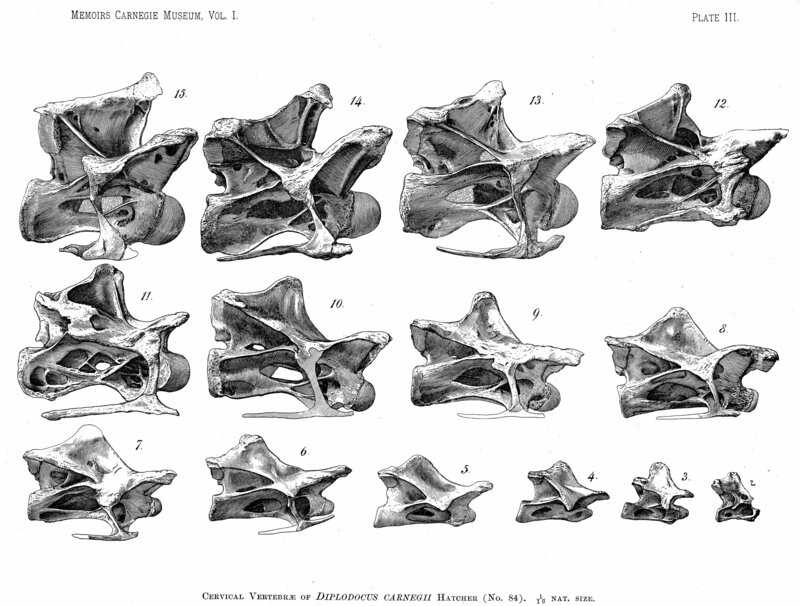 The simple morphology of anterior cervicals reflects both earlier ontogenetic stages and more primitive character states. 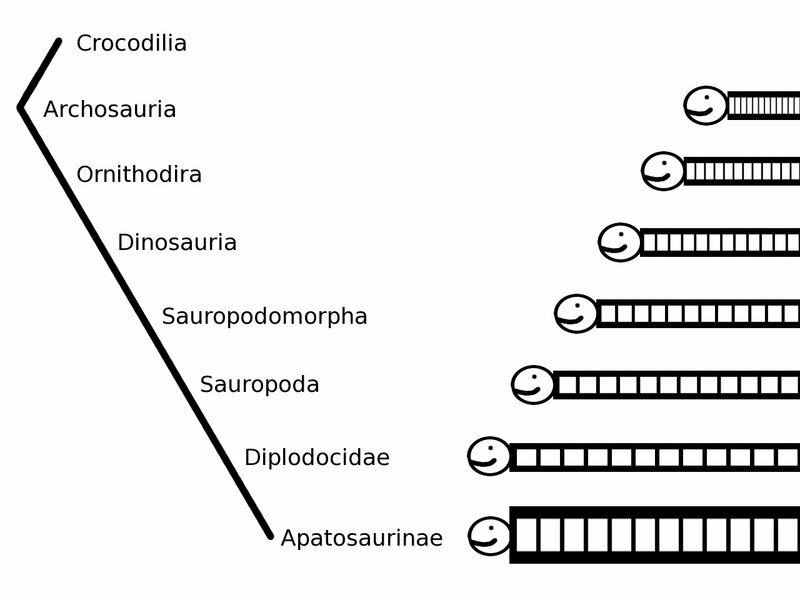 As Mike says, in sauropod necks, serial position recapitulates both ontogeny and phylogeny. So if you have a complete series, you can do something pretty cool: see the intermediate stages by which simple structures become complex. If you’re thinking this might have something to do with my impending SVPCA poster, you’re right. Here’s the abstract. 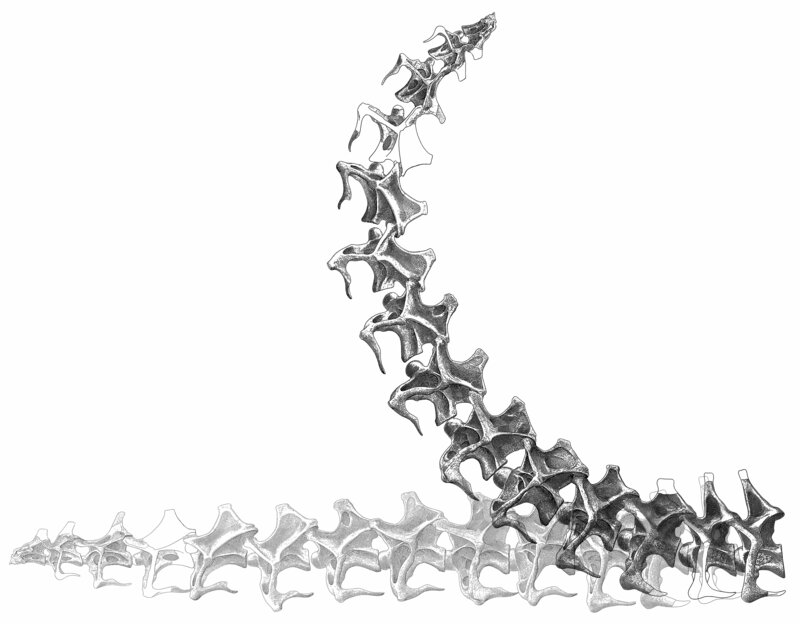 For more on serially increasing complexity in sauropodomorph cervicals, see this post. Preprints are in the air! A few weeks ago, Stephen Curry had a piece about them in the Guardian (Peer review, preprints and the speed of science) and pterosaur palaeontologist Liz Martin published Preprints in science on her blog Musings of Clumsy Palaeontologist. The latter in particular has spawned a prolific and fascinating comment stream. 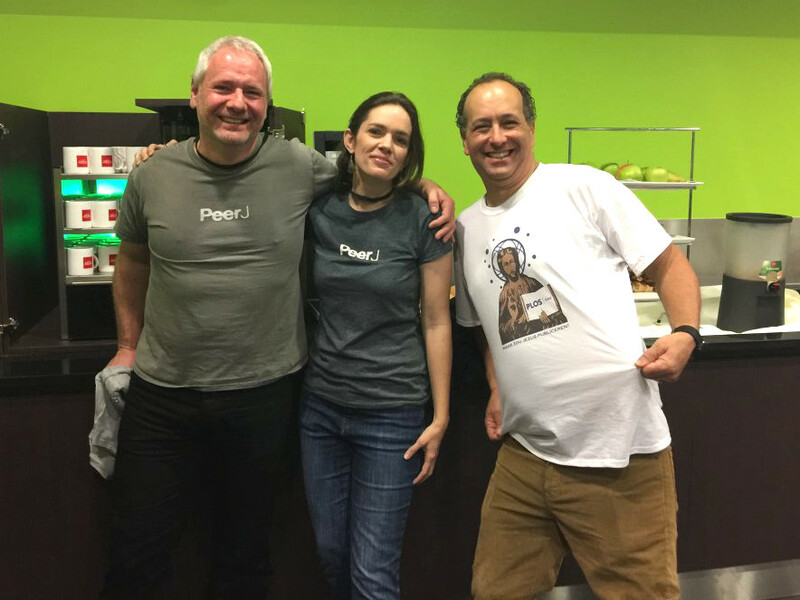 Then SV-POW!’s favourite journal, PeerJ, weighed in on its own blog with A PeerJ PrePrint – so just what is that exactly?. Following on from that, I was invited to contribute a guest-post to the PeerJ blog: they’re asking several people about their experiences with PeerJ Preprints, and publishing the results in a series. I started to write my answers in an email, but they soon got long enough that I concluded it made more sense to write my own post instead. This is that post. As a matter of fact, I’ve submitted four PeerJ preprints, and all of them for quite different reasons. 2. Dinosaur diversity. Back in 2004 I submitted my first ever scientific paper, a survey of dinosaur diversity broken down in various ways. It was rejected (for what I thought were spurious reasons, but let it pass). The more time that passed, the more out of date the statistics became. As my interests progressed in other directions, I reached the point of realising that I was never going to get around to bringing that paper up to date and resubmitting it to a journal. Rather than let it be lost to the world, when I think it still contains much that is of interest, I published it as a pre-print (although it’s not pre- anything: what’s posted is the final version). 4. 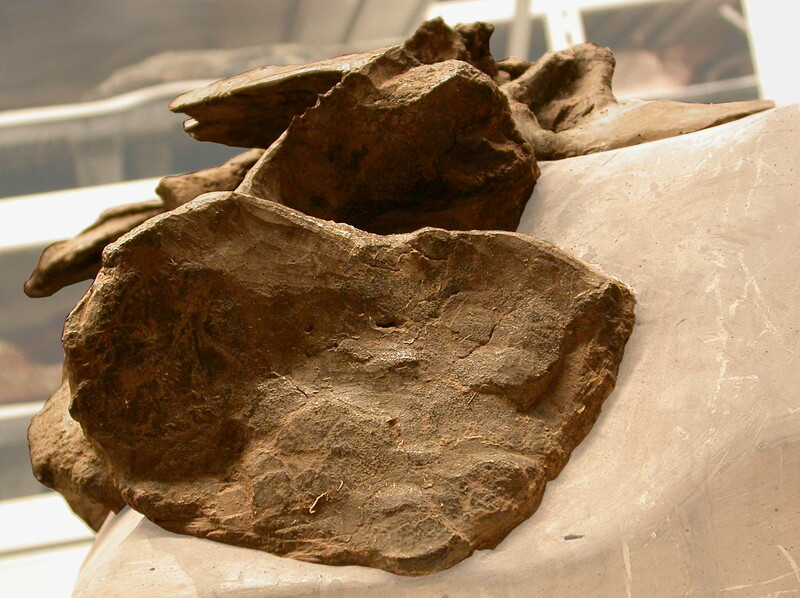 Apatosaurine necks. Finally, I gave a talk at this year’s SVPCA (Symposium on Vertebrate Palaeontology and Comparative Anatomy), based on an in-progress manuscript in which I am second author to Matt. The proceedings of the symposium are emerging as a PeerJ Collection, and I and the other authors wanted our paper to be a part of that collection. So I submitted the abstract of the talk I gave, with the slide-deck as supplementary information. In time, this version of the preprint will be superseded by the completed manuscript, and eventually (we hope) by the peer-reviewed paper. 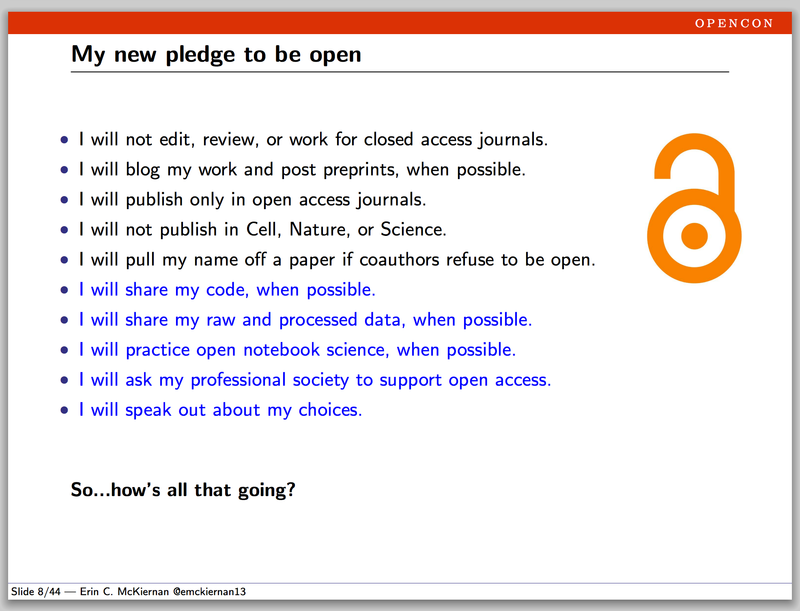 So the thing to take away from this is that there are lots of reasons to publish preprints. They open up different ways of thinking about the publication process. I am posting here courtesy of Mike and Matt with two objectives. First, I would like to provisionally offer Birmingham as a venue for the 2017 SVPCA meeting, with a host committee of myself, Ivan Sansom, and our postdocs and students. I propose to host the meeting at the University of Birmingham and the Lapworth Museum of Geology, following the latter’s redevelopment and reopening in 2016. Second, I would note that this offer is conditional on the implementation of some changes in SVPCA organisation that I believe will help secure the future of the meeting, while retaining its current atmosphere. Although I have already discussed these proposed changes with many colleagues via email, a broad scale and open consultancy and discussion within the community is needed, hence this post and open comment section. Despite the apparent success of recent meetings, there are a couple of factors that give me substantial concern about its future. 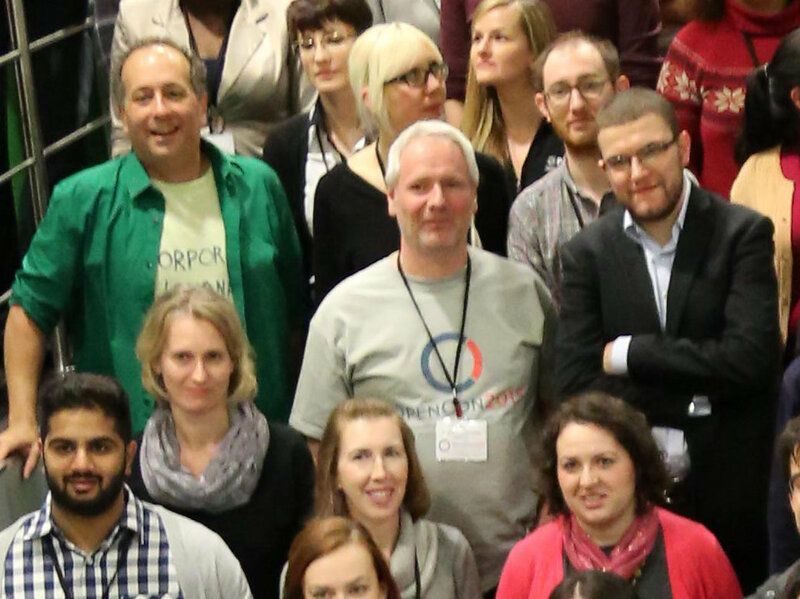 There is a trend, noted by several people, toward increasing disengagement from a large component of the early postdoctoral career and established academic community, with many of these individuals (including myself) attending SVPCA less and less frequently. Numbers provided by Richard Forrest show a small but steady decline in the number of people paying full registration (i.e. non-students) over the last five years. Having discussed this with a number of colleagues, it is clear to me that it stems from multiple reasons, including meeting length and structure, ever-increasing time constraints, and competition with the myriad other meetings such as PalAss, SVP, EAVP, ICVM etc. This disengagement is worrying for a number of reasons, but perhaps most pressingly because it is exactly this part of the vertebrate palaeontology community who are generally expected to organise the meeting in future years. I am also concerned that people are not queuing up to organise the meeting. We are just about getting by from year to year, but offers are sparse at exactly a time when there are almost certainly more vertebrate palaeontologists employed in the UK than ever before. Why is this? Well, taking on the organization of SVPCA in its current form is not exactly attractive in the current academic world of REF, impact, museum cuts, and the ongoing marketization of universities, with charges for the use of lecture theatres and other spaces increasing rapidly. The meeting is long relative to its size (particularly when SPPC is considered) and its budget is low, and the lack of any formal organization to SVPCA means that there is limited support or continuity from year to year. Hosting it is unlikely to substantially enhance your CV, but it will certainly impact negatively on your other outputs (i.e. papers, grant applications) for that year. We risk reaching a point in the near future where there is no-one willing to host the meeting and the meeting grinds to a halt. My proposal is that the meeting could bear a small degree of formalisation and modernisation without losing its character, and doing so would ease pressures on hosts. Following discussion with a broad range of colleagues within the SVPCA community, I am proposing that a small SVPCA steering group be established as part of the planning for the Birmingham meeting. This steering group could be established in a simple, representative, democratic, cost-free, and light-touch manner. 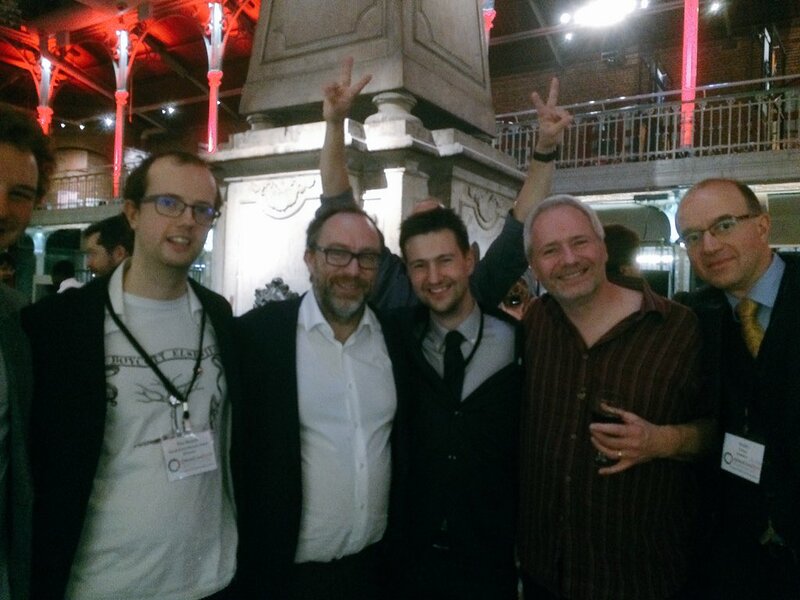 This group would not need to meet in person other than at SVPCA itself so there would be no financial cost. There would then be an open and democratic basis for deciding upon the future of the meeting and ensuring continuity from year to year. This committee could come up with an agreed list of recommendations for how the meeting should be organised in the future, addressing topics such as meeting length, the role of SPPC, the relationship of the meeting to PalAss (who already provide significant financial and logistic support), the abstract review process, and innovations such as lightning talks, workshops and keynotes. It could also find solutions to the significant logistic issues to do with bank accounts, payments and the like, all of which place unnecessary strain on the local organisers. Local organisers would still have considerable autonomy, but they would receive more support. As an initial proposal I suggest a small committee that attempts to represent the different communities that make up SVPCA. The last and next meeting hosts should be on, as well as perhaps five additional elected members, serving limited terms, to represent the student, early career researcher (up to 10 years post-PhD), senior academic, museum, and non-professional communities. Pretty much all of the feedback from colleagues for this idea to date has been positive. Note that this does not imply the formation of a formal society (although that would be an option that a steering committee could discuss), and nor does it challenge many of the aspects of SVPCA that so many of us find attractive, such as its friendly atmosphere or the absence of parallel sessions. 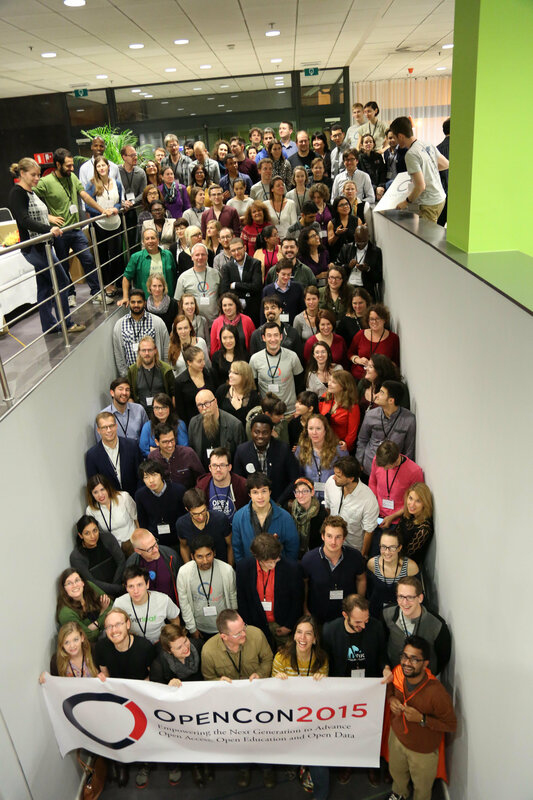 I hope it will provide a framework for us to continue to promote scientific excellence and drive up standards in UK vertebrate palaeontology, and help secure the future of the meeting for the next 60 years. I would love to hear any opinions that the community has on this proposal, and the future of SVPCA more broadly.